Splinter Cell Project In The Works | Nerd Much? Hints that Ubisoft is working on the next Splinter Cell game come from the company’s CEO Yves Guillemot. In response to question on Reddit about the game, he said that the series is something “we talk about a lot.” Apparently it is one of his favorite games too, but he didn’t have any specifics to share about any upcoming game. Guillemot only stated that “teams are working on different things, so stay tuned for more,” a very vague statement that may or may not be alluding to a new game in the series. What is truly the proof however, is in an interview with UbiBlog. Here Guillemot stated that Ubisoft is “receiving lots of sketches and proposals around the brand” and that they are definitely “going to pick one up.” So clearly Ubisoft is open to pitches for a new game in the series and they do plan on saying yes once they find the right one. It will certainly be quite some time before we see anything, but Guillemot has confirmed that a new Splinter Cell is on the Ubisoft to-do list. 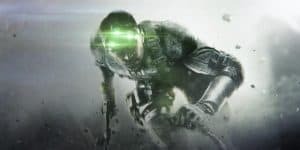 The last Splinter Cell game was about four years ago and until now there hasn’t been any hints that Ubisoft was planning a sequel. This is great news for fans of the series, and we’re guaranteed a good game if it’s the CEO’s favorite, right?